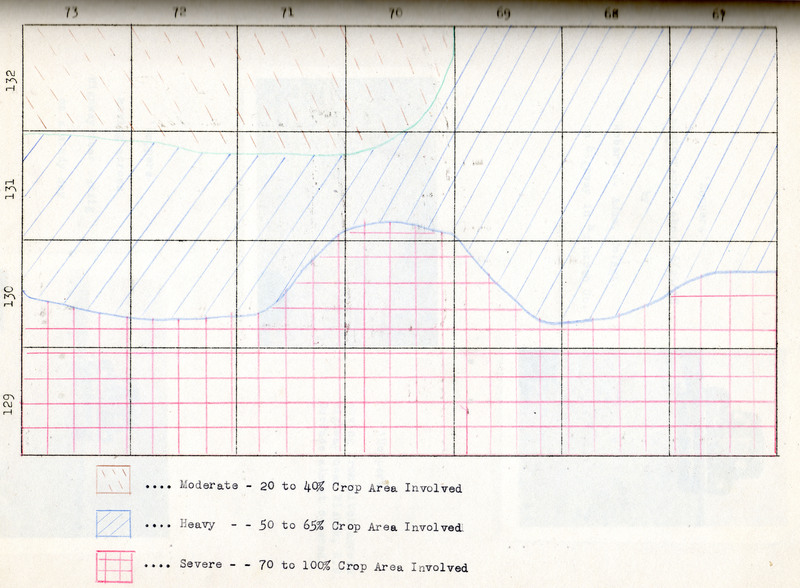 This document details research done at the North Dakota State University Archives. 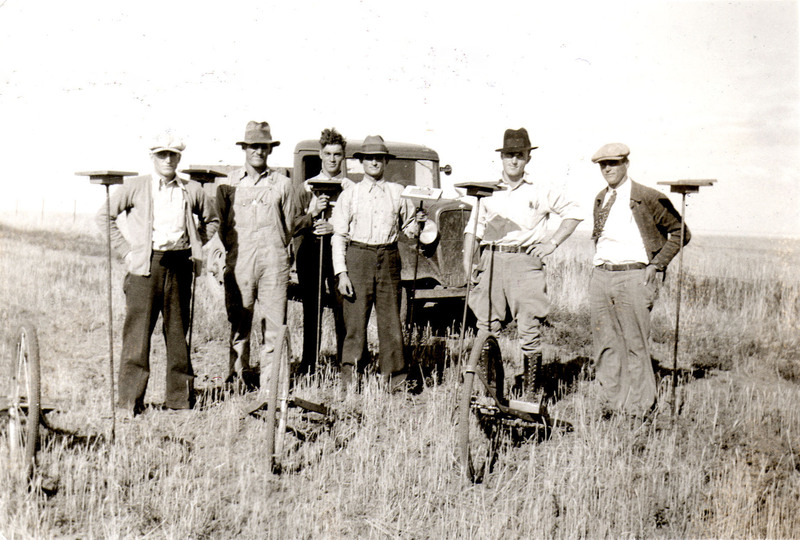 The records used are Cooperative Extension Annual Reports from McIntosh County, North Dakota. 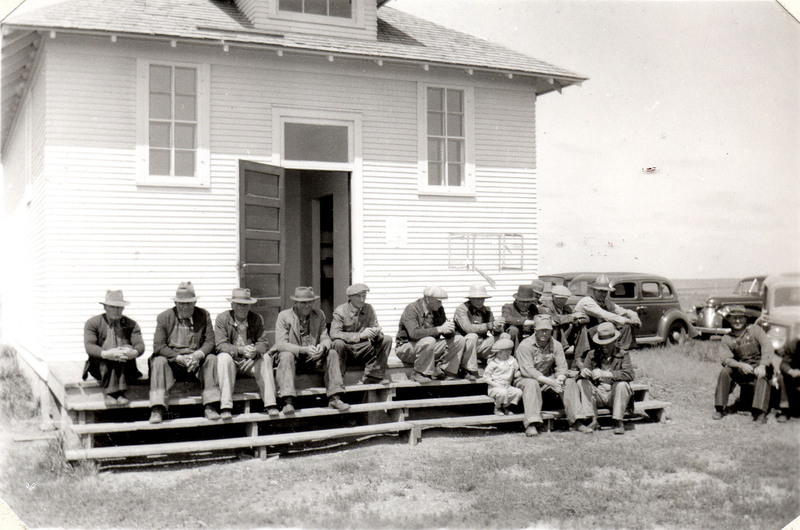 The aim of the research is to identify photographs in the report illustrating vital aspects of life in the Missouri Coteau region and to record information explicating the images. Links in the table below call up images of interest that have been scanned from the manuscript reports. Most images, including all photographic images, are scanned at 600 dpi and saved as TIFs. Certain other images, mainly textual things, are scanned at 300 dpi and saved as PDFs. TIFs have been saved also as JPGs for reference and web use. 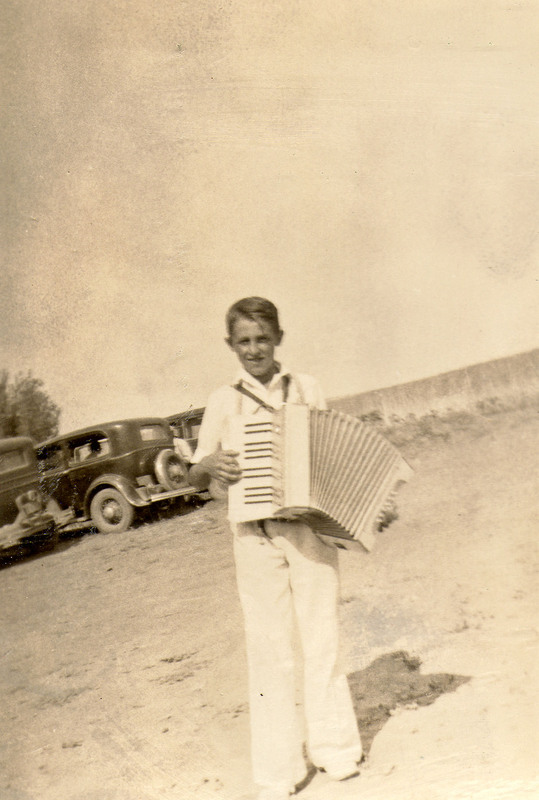 Thanks to NDSU Archives for making these records available for research. 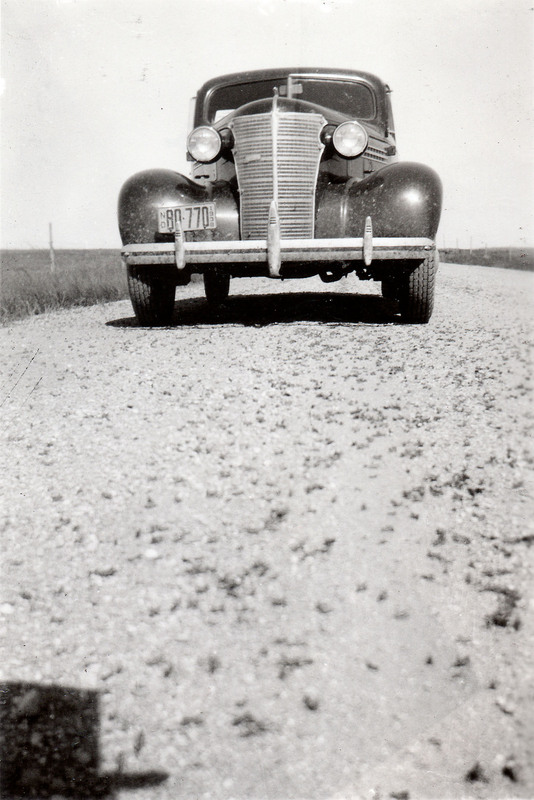 All images copyright NDSU Archives. The wheat program progress in McIntosh County is pretty well advanced and most applicants have signed up to date. . . . The farmers in general are willing to cooperate introducing acreage and to comply with the regulations and limitations of the wheat plan. . . . The thing most of them are looking forward to from now on is the receiving of their checks. By this time the agent (Robert J. Adam, County Agricultural Adjustment Agent) is candid about the process of moving from just managing the farm program to implementing a true extension program. The attitude of the people of McIntosh County towards extension work is gradually becoming more favorable. The public is beginning to see that those farmers and housewives who are following plans of improvement are making greater headway toward recovery from the recent depression. 1. The large majority of the people are of foreign birth and do not speak or read the American language. 2. Very little extension work has ever been carried on in the county. 3. Decided lack of finance and credit makes it almost impossible to start the various projects. 4. There are very few natural leaders who will take an interest and further the program. 5. There is a decided lack of organization, such as clubs and civic organizations for the purpose of furthering improved methods. 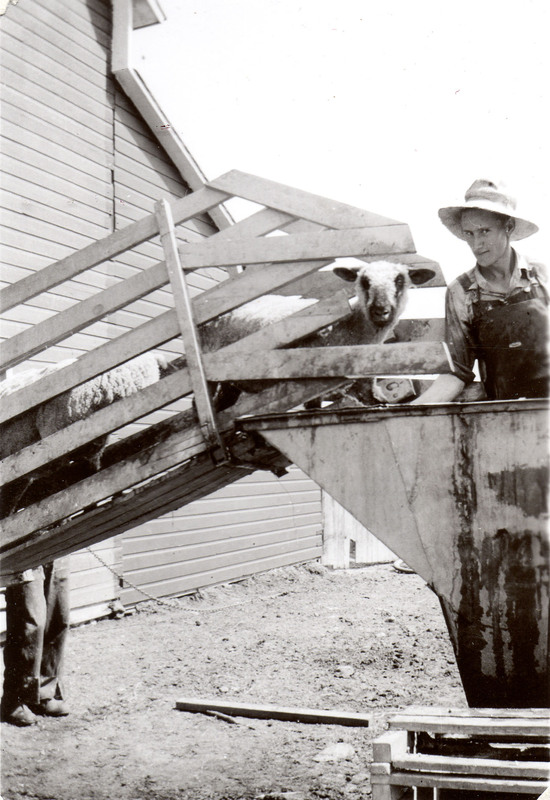 This is the first report illustrated with photographs, and some of them deal with administration of the farm program. 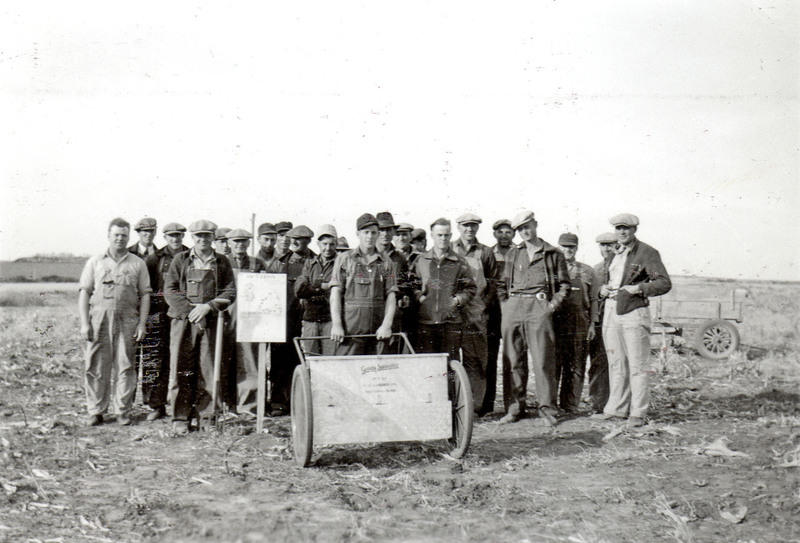 The Agricultural Conservation Soil program of the Agricultural Adjustment Administration as carried out by the farmers of McIntosh County Agricultural Conservation Association . . . has met with nearly a 100% approval by all farmers and landowners of the county. In general, most farmers are now planning their farming activities to fit the present program. 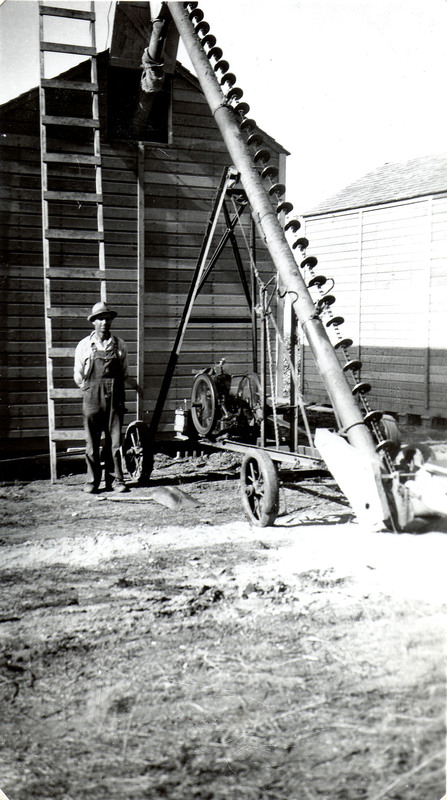 McIntosh County has approximately 1160 farmers, of which 98% submitted work sheets in the spring of 1936. The report gives the names of 28 “supervisors” of the program and one “boss supervisor,” Carol Olsen, of Lehr. 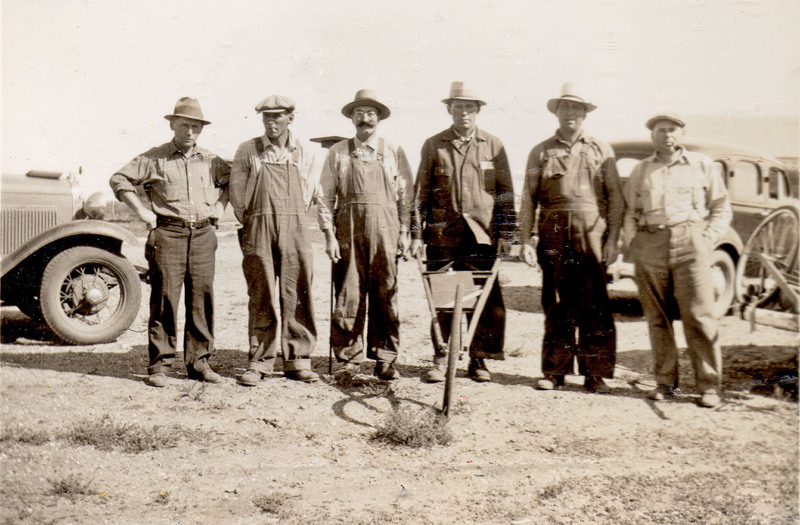 Supervisors are responsible for measuring acreage. The last day of the Fair, August 26th, will be 4-H Club Day. Club members are urged to attend the fair on that day as the clubs should join in the parade. All club members are invited to attend the fair on that day and all club members are expected to march in the parade at 3:00 P.M. that day. Every club member who attends the fair on the 26th will receive a club cap free. The agent reports, again, that club enrollment is growing. Boys’ and girls’ clubs seem to be the success story of recent years. The annual 4-H picnic was held at Lake Hoskins on 20 June, with 175 club members and 325 family and friends attending. Kittenball games, horseshoe pitching, a band concert by the Venturia Band, lunch, group singing, and program presentations by members all were on the program. 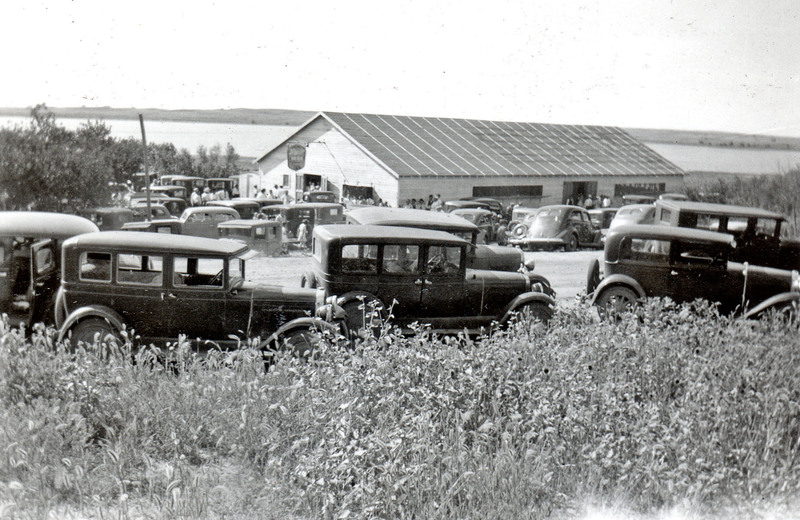 The Tri-County Fair in Wishek was 13-15 September, attended by some 4500 people. About 200 4-H club members participated on club day, the final day of the fair. The county’s livestock judging team placed third in the southeast district contest held in Fargo. Included were Willie Hochhalter of Wishek, Solomon Hochhalter of Wishek, and Harold Essinger of Wishek, plus County Agent Robert J. Adam as coach. The Agricultural Conservation Program continues in operation, with some change in terminology. What were called “supervisors” are now called “committeemen.” There is a county committee of four members, Ed Bauer of Zeeland, president; a board of directors with eight members, Bauer presiding; and seven district committees with four members each. 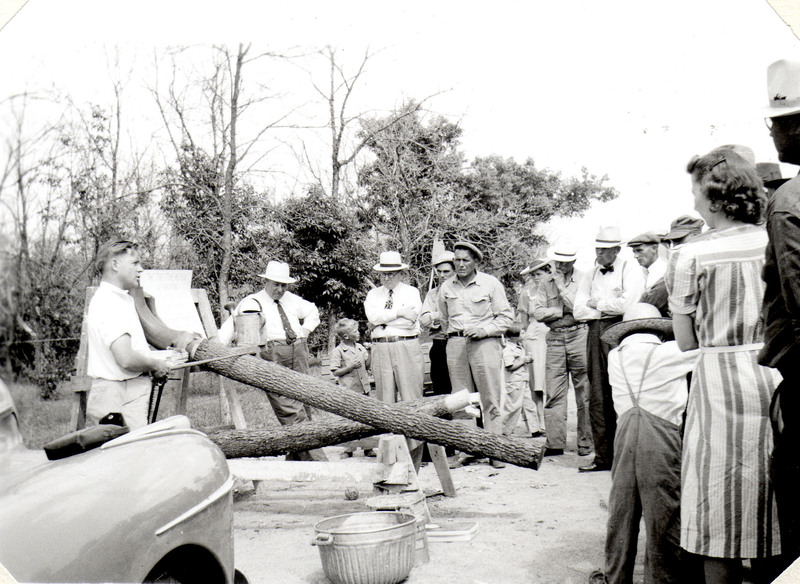 During the year, 89 meetings were held on agricultural conservation work of which, 28 were small group discussion meetings conducted by the community committeemen in their own districts. The soil conserving and soil depleting crops were total failure in the county due to drought and insects this year and therefore, no real worth while accomplishments can be shown. 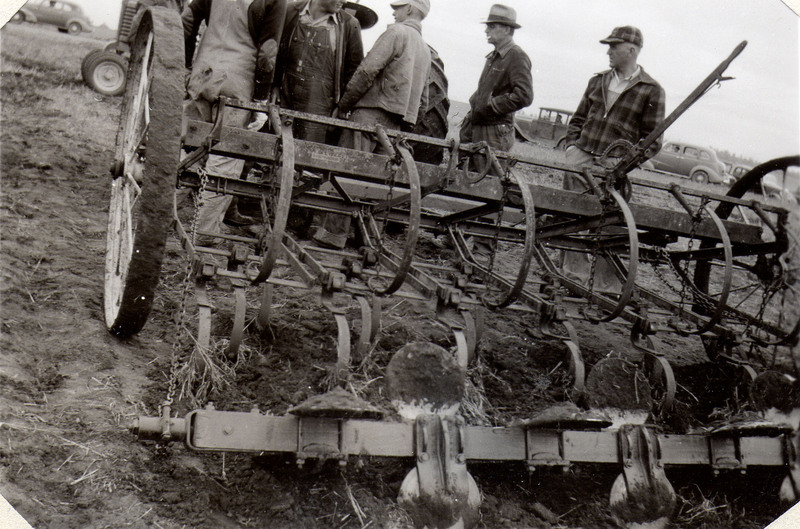 There were the beginnings, however, of experimentation for soil erosion control. 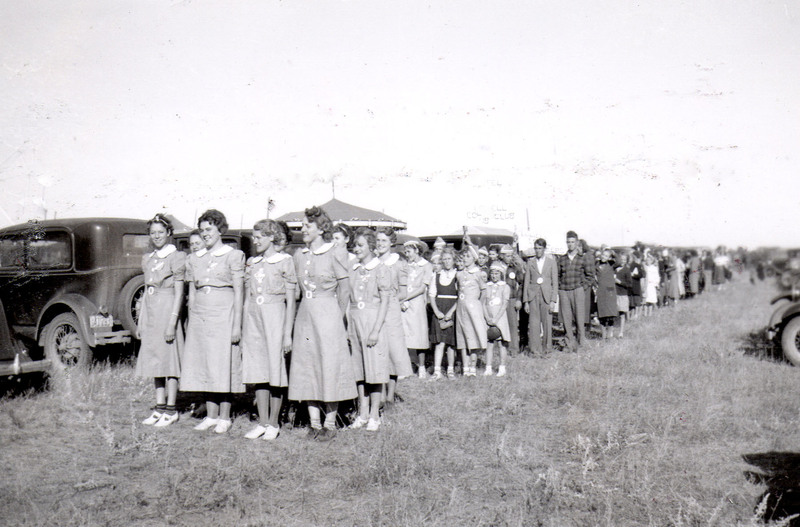 County homemakers had their Achievement Day and picnic at Lake Hoskins, 3 miles west of Ashley, on 14 July. There was a crowd of 400 in atte3ndance. There was a business meeting, lunch, and a series of program presentations. The highlight of the afternoon’s program was an address by Prof. A.G. Arvold on “Neighborhoods”, which was greatly enjoyed by everyone. Held at Wishek, 12-14 September. Lambs were shown by boys from three different clubs. 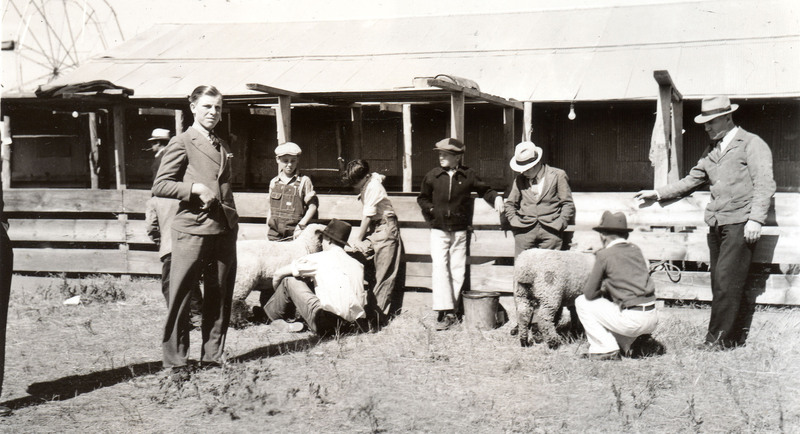 Photo (top) on p. 42, Sheep Fitting & Blocking Demonstration at Tri-county Fair, Wishek, conducted by Carl J. Freeman and Robert J. Adam, Agts. 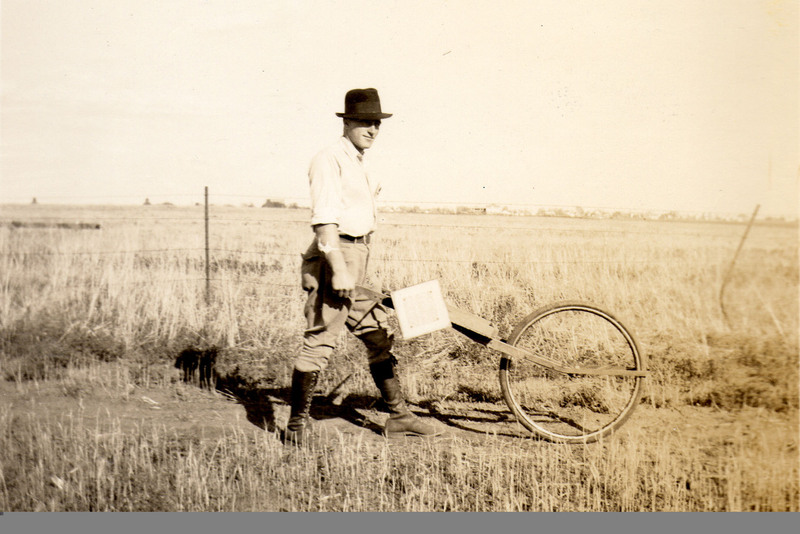 McIntosh county has a heavy egg deposit by grasshoppers in the fall of 1937 and the result was that all the crop area of the county was seriously threatened with grasshopper damage for 1938. 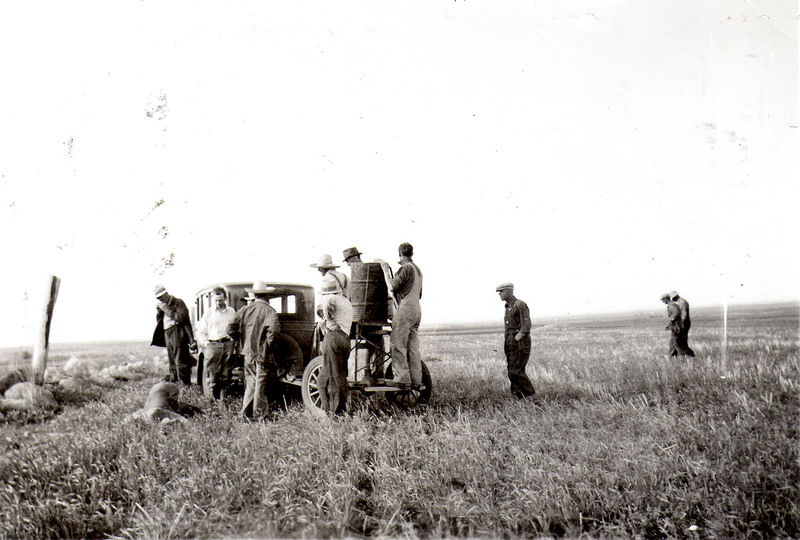 The grasshopper hatch in the spring of 1938 far surpassed the estimates and was the heaviest hatch ever to occur in this county. The hatching started early due to a very dry, warm and favorable spring season. During the height of the hatching season period it was nothing uncommon to find as many as approximately 2000 young hoppers per square foot in protected areas, such as road sides and weedy spots. 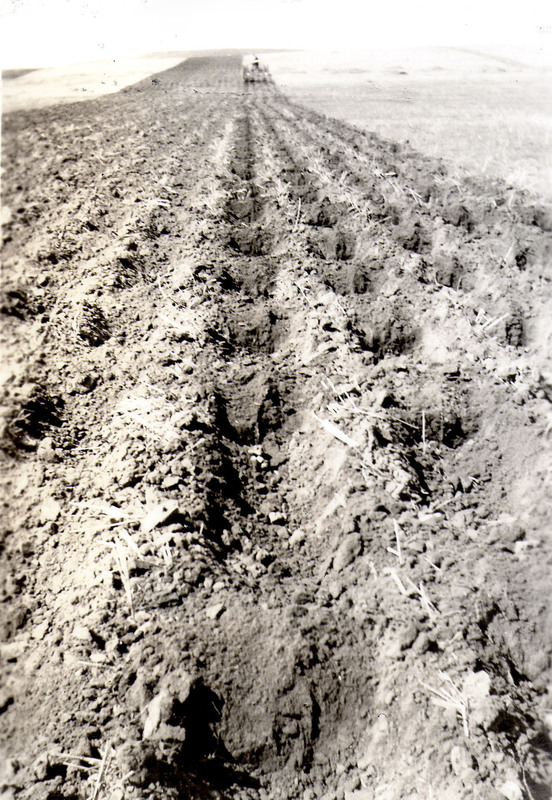 Due to extremely dry conditions and the low ebb of economic conditions, very little tillage such as plowing, field cultivation or any other ground tilling was done in the Fall of 1937 and spring of 1938, and consequently very few hopper eggs were destroyed. Therefore, the hatch was very general on all cvrop land as well as on pastures and road sides. 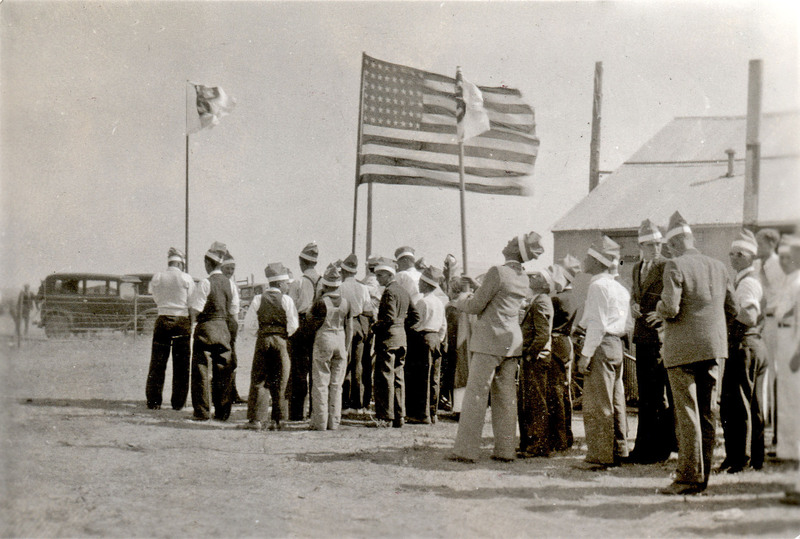 The office organized educational meetings all over the county. The county commissioners “reviewed the situation” and “took action to organize.” They signed an agreement to cooperate with the “State and Federal Grasshopper Control set-up.” A committee of six was appointed in each of the 28 townships to supervise grasshopper control. The county agent was authorized to order bait. 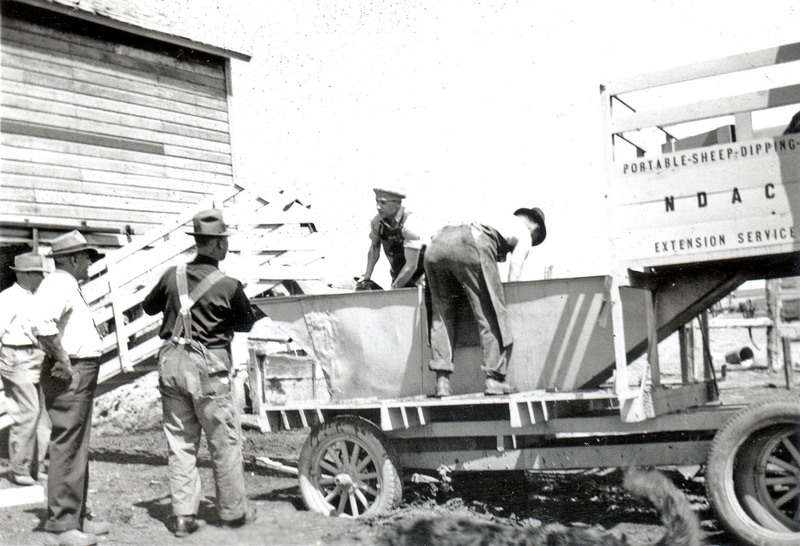 The county also applied to the WPA to establish bait mixing stations in several locations. The net cost of the grasshopper campaign to the county was $950.48. 122 bait spreaders were built, two mixing stations set up. 867 spread 1,556,000 pounds of bait. The bait formula: 11# bran, 300# sawdust, 2 gals sodium arsenite, 28 gals water. Mixing done by WPA crews in vats 12’ long, 4’ wide, 1’ deep. Ashley station employed 30 men and a foreman, Wishek station employed 19 men and a foreman. Photo (top) on p. 63, ’Hoppers photographed about 6/25/38 by Robert J. Adam, Co. 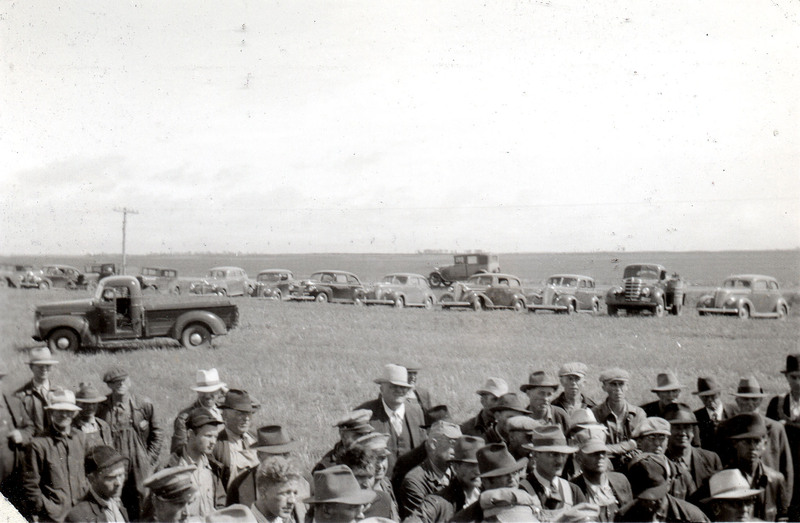 Agt., on Highway in McIntosh Co.
Photo (middle) on p. 63, ’Hoppers moving from ditch across highway near Wishek, N.D. Surface almost covered. McIntosh County normally has a sheep population of approximately 8000 head. The small farm flocks have been increased during the year, because farmers find they can raise sheep more successfully on coarse roughage than cattle. 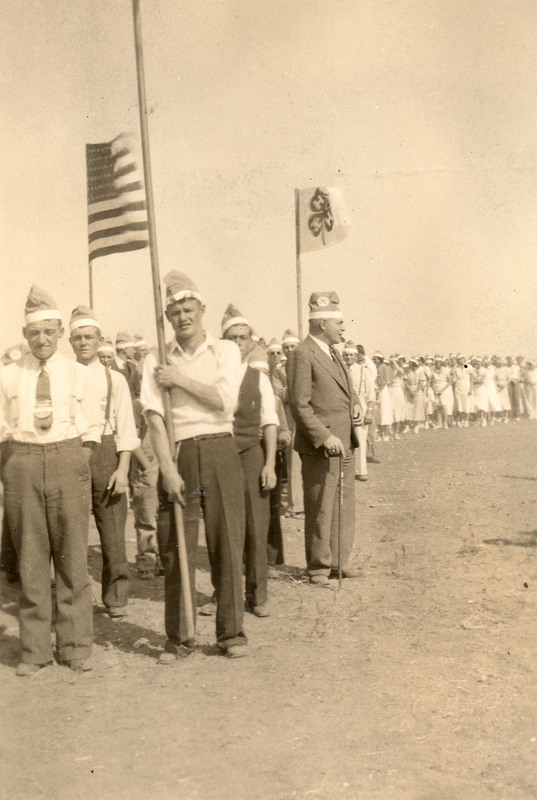 There have been three sheep clubs organized, with 19 members. Farmers are making use of the CCC Wool Loan program, with 92 farmers marketing 17,563 pounds of wool. 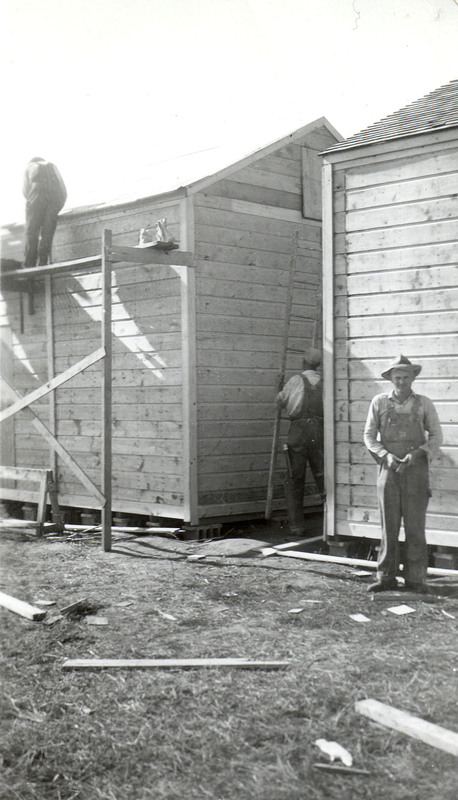 The county agent set up three receiving stations for the wool. 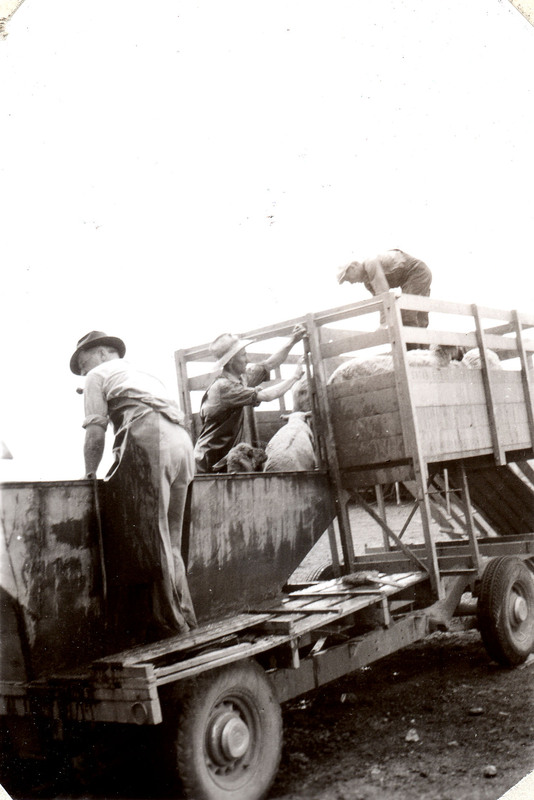 Farmers got cash advances when they delivered wool. Map on p. 84, 1938 C.C.C. Wool Loans and Stations, McIntosh Co.
McIntosh County has no active organized soil conservation districts or demonstration farms. 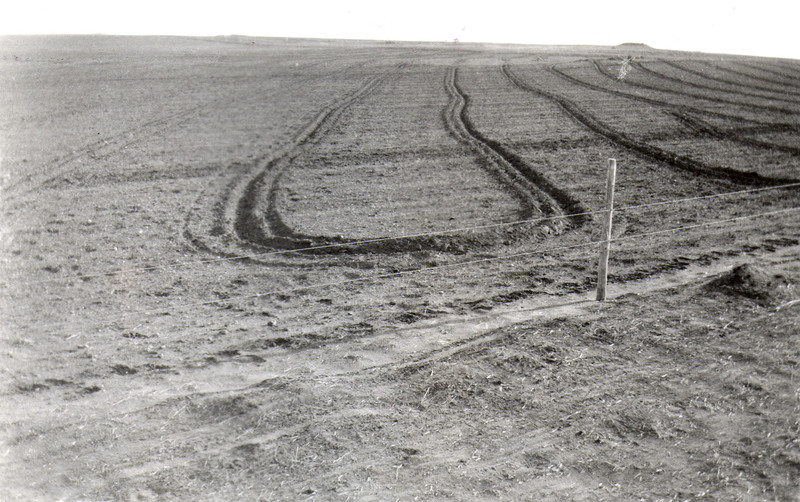 Some preliminary work has been done by Gust N. Geiszler, Soil Conservationist, and the County Agent. 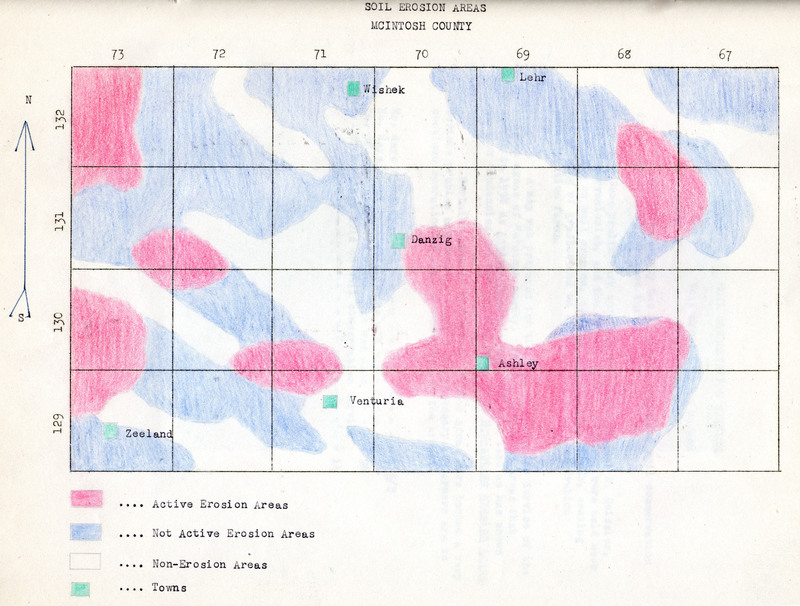 Held some meetings across the county and prepared a map of erosion areas. 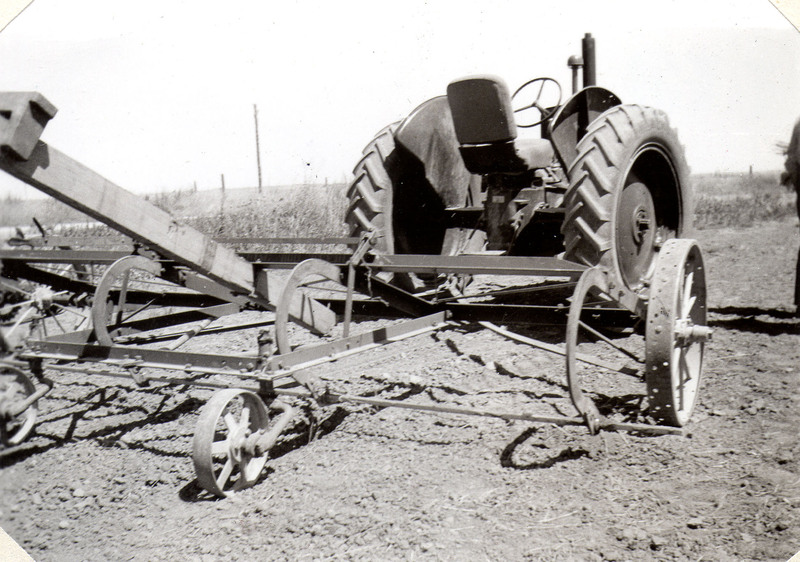 Photo (top) on p. 94, Three bottom Plow with Moldboards Removed / This cuts weeds, loosens surface, leaves trash on surface for protection against soil drifting. 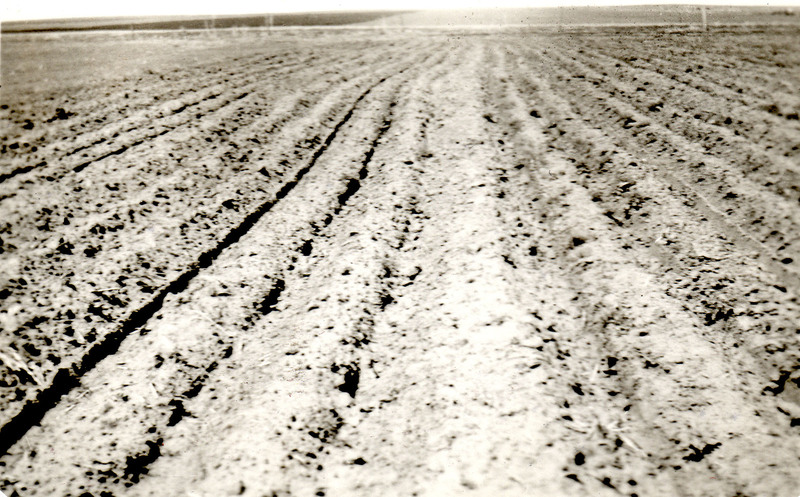 Photo (bottom) on p. 94, Theo Woehl, Wishek in Spring of 1938 stopped soil drifting and obtained a good stand of wheat by criss-crossing his field diagonally with gang plow. 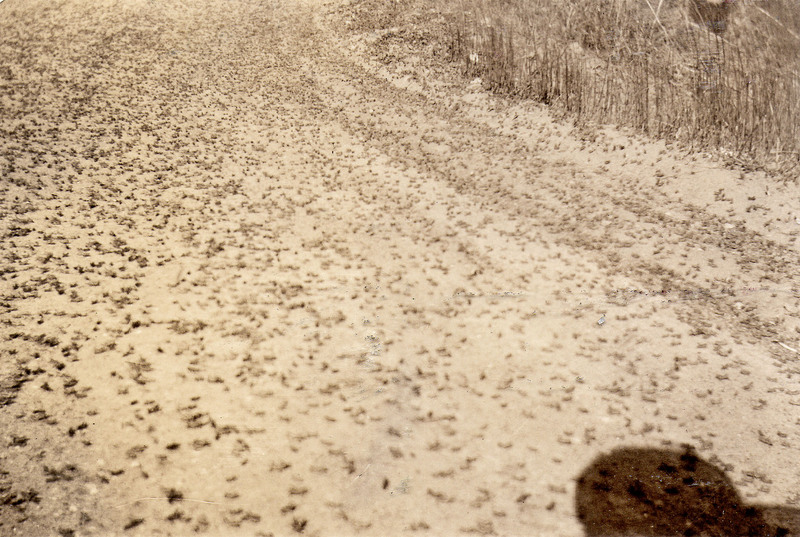 The egg survey in the Fall of 1938 indicated a very light spotted infestation of ’hopper eggs in McIntosh County. According to the survey, no serious damage could have been expected with otherwise fairly normal conditions. The spring check-up on eggs, however, indicated a very good survival of eggs. 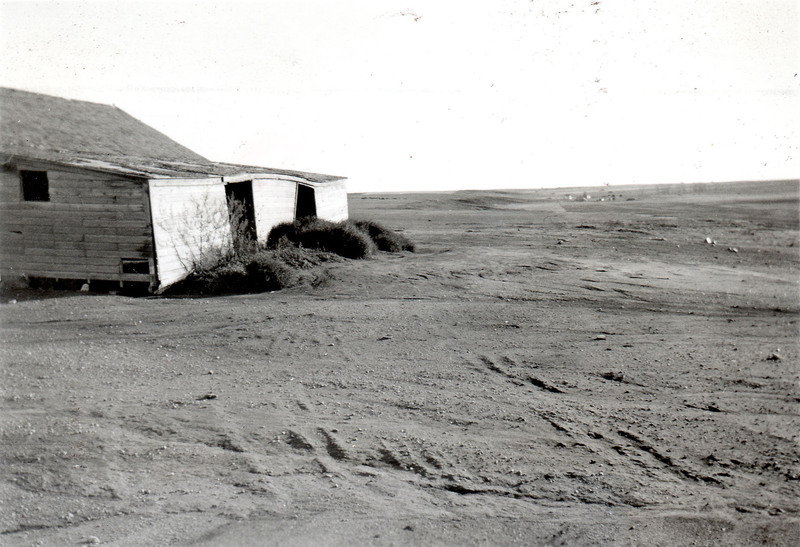 The spring of 1939 was very dry, which made the ’hopper hazard more eminent. . . . Therefore, the hatch was quite general on all cropland as well as on pastures and roads. 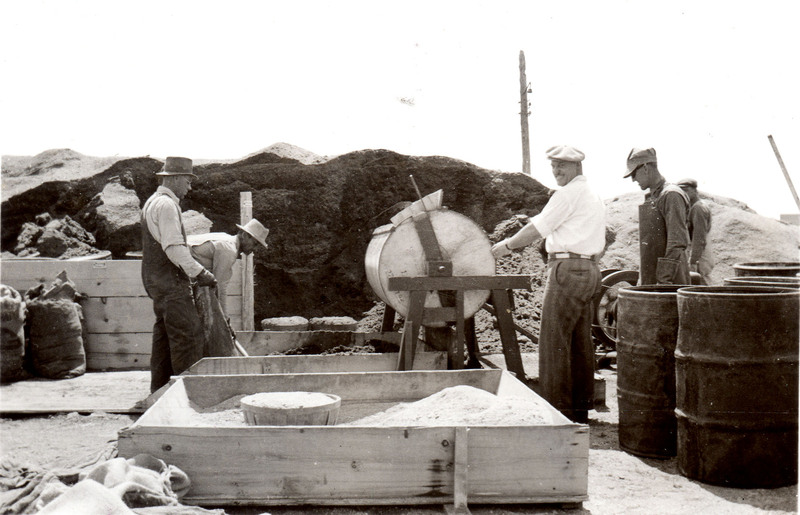 Once again there was a county campaign with WPA mixing stations. The general attitude has changed from abandonment of wheat raising to improving the methods of wheat farming – that is, to smaller acreages, improved tillage, good seed, adapted varieties and marketing of the crop. 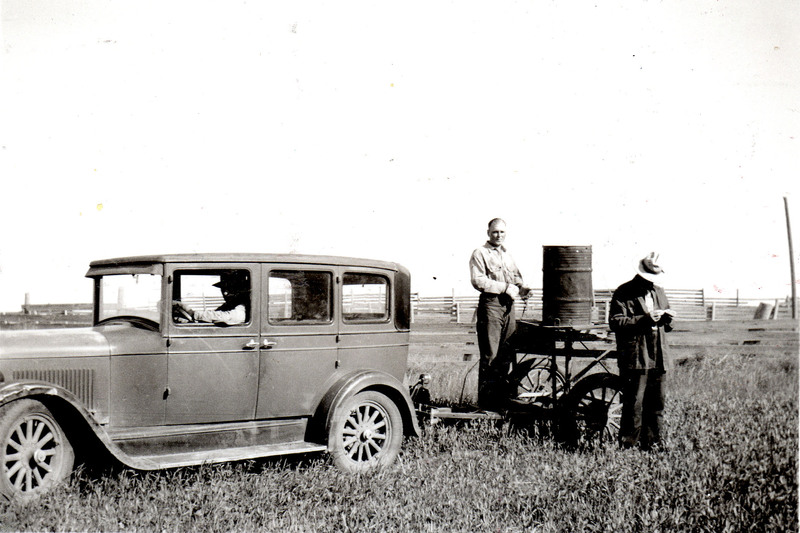 The county was allotted 129,000 acres of wheat for 1939, which is approximately 40% of the total cropland. . . . 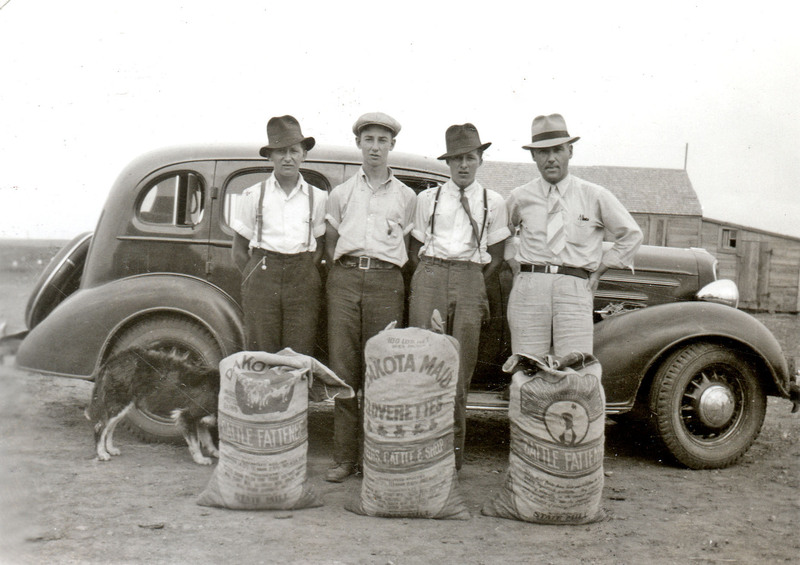 The varieties recommended for McIntosh county were Thatcher, Reward, some Kubanka, Durum and Red Durum. . . .
Thatcher wheat comprised about 55% of the seeded acreage in 1939. Photo (top) on p. 14, Wind Erosion / Northeast McIntosh Co.
Held 11 meetings, average attendance 12.8. Had a booth at the Tri-County Fair. 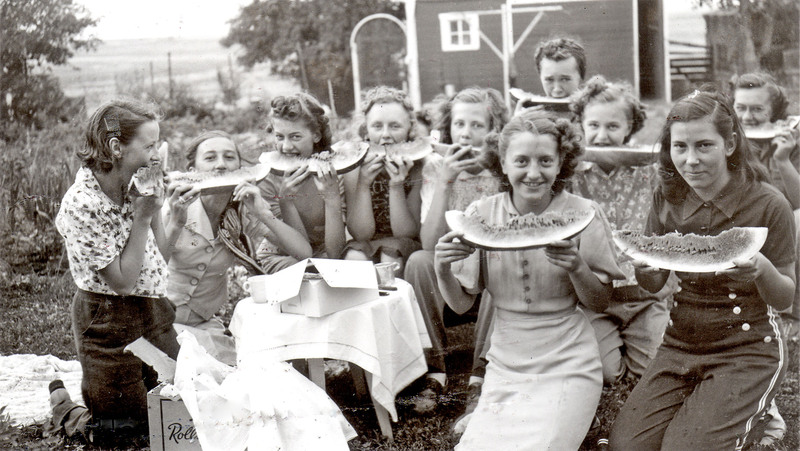 In August, the Jolly Workers enjoyed a picnic. Pictures were snapped by the local leader while the lunch was being enjoyed. Infestations this year were mainly in the southern parts of the county, made worse by fact that neighboring areas of South Dakota had no control programs. 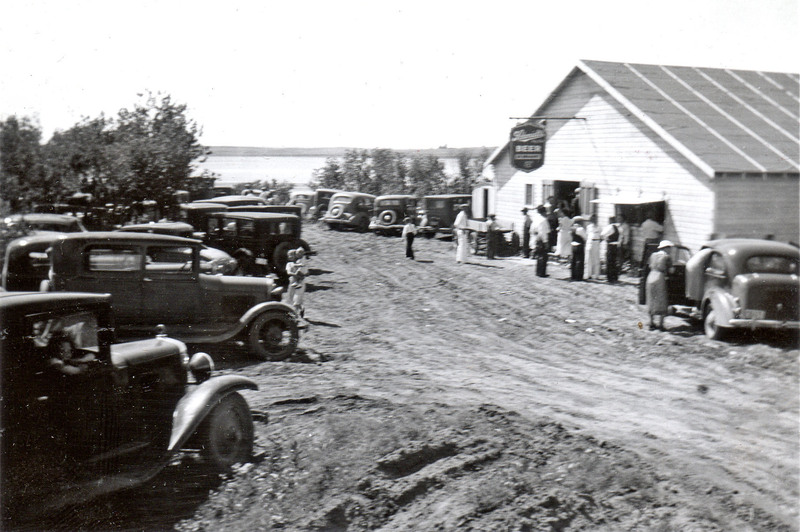 There were organizational meetings again, and a county program, and two WPA mixing stations. 340 farmers got 158 tons of mixed bait. 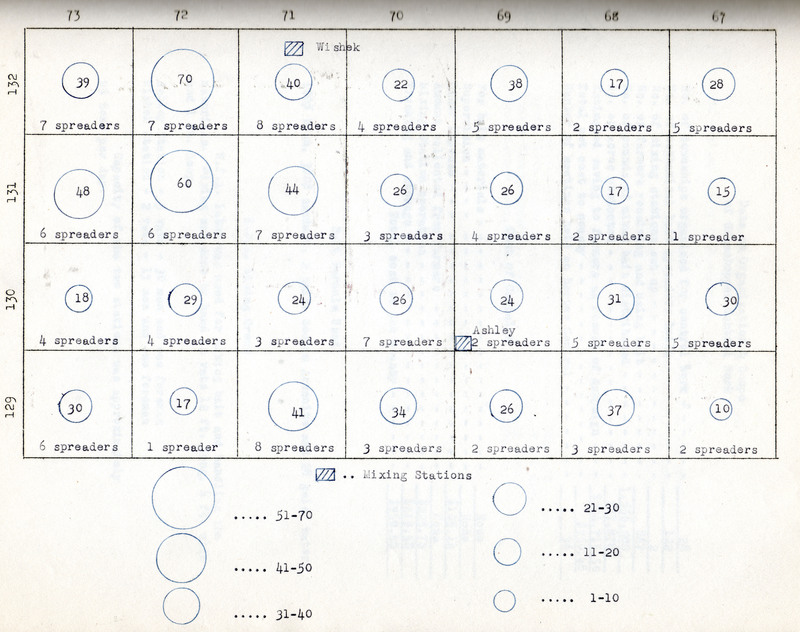 122 spreaders were used. 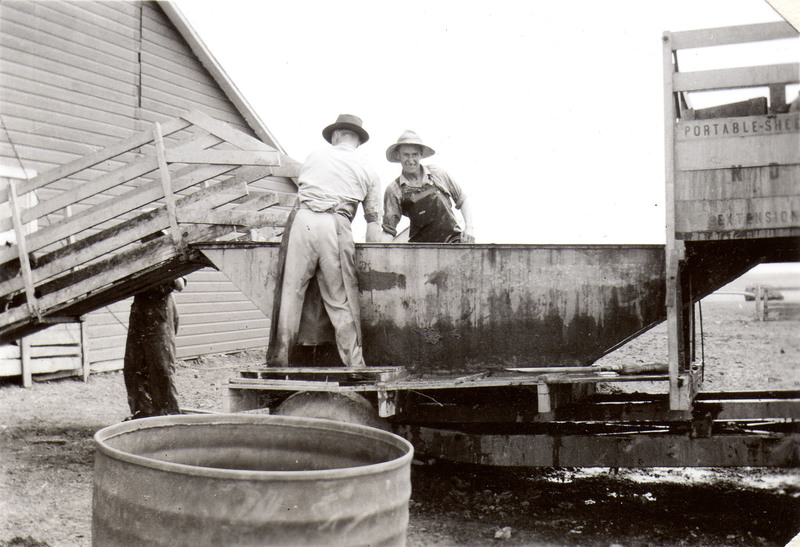 Photo on p. 78, Hopper Bait Mixing Station at Wishek, N. Dak. 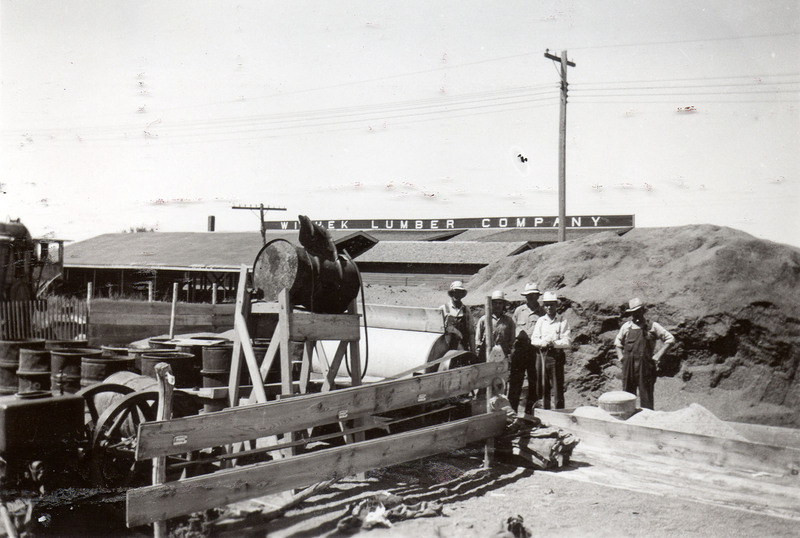 Work on the cattle project was largely to encourage increasing present small herds and better feeding for production and growth. 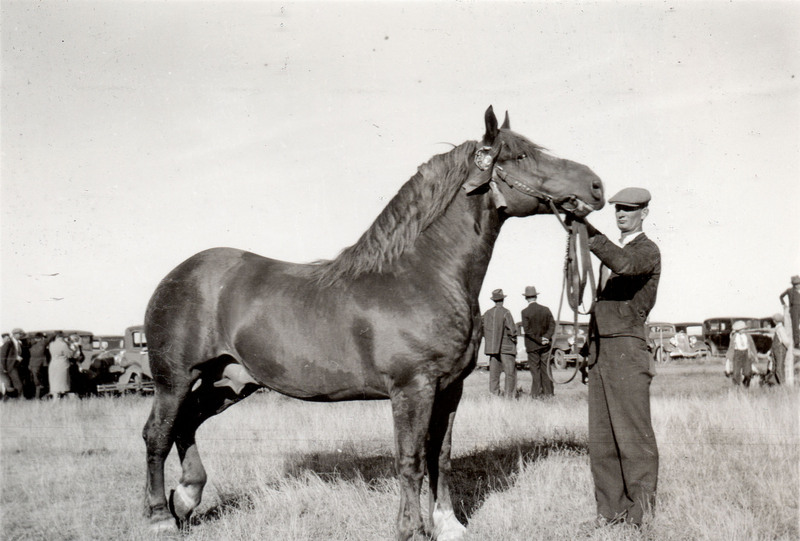 A number of farmers were assisted in obtaining breeding stock of higher grade or purebred. Seven bulls were placed. 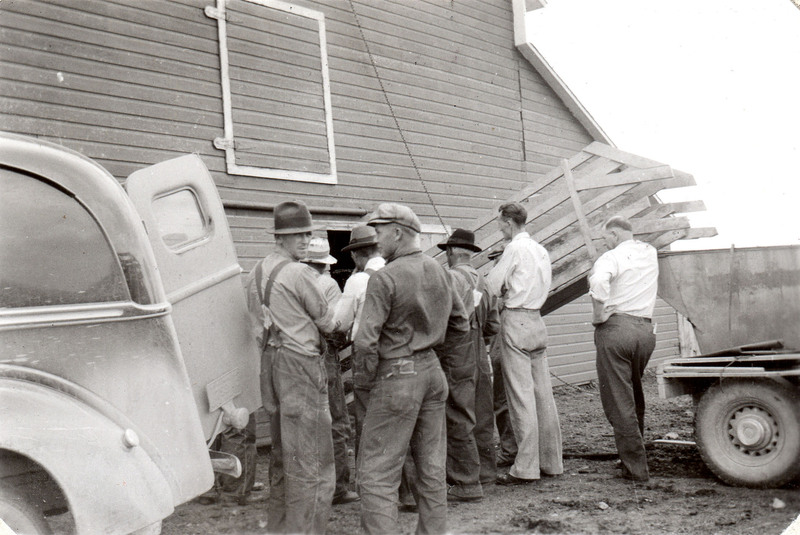 The North Dakota Livestock Mutual Aid Committee made a loan for one farmer to buy a bull. 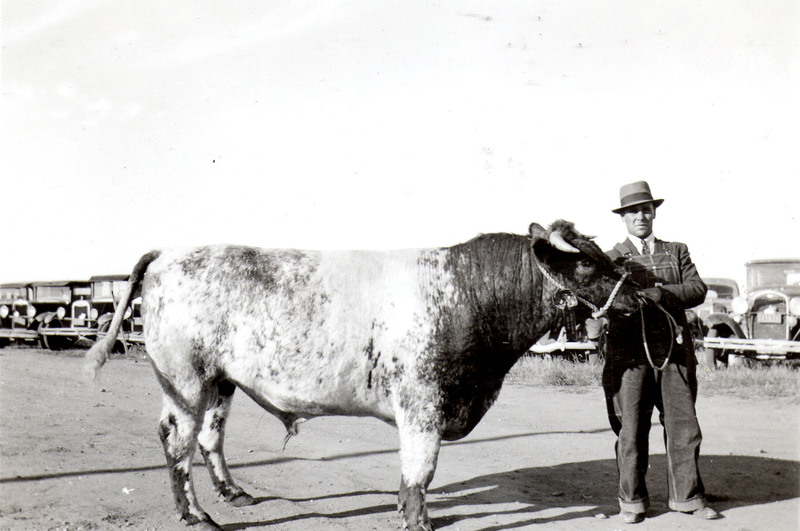 Photo (bottom) on p. 108, Beef Shorthorn Bull Financed through NDLMAC owned by Jacob L. Raile, Wishek, N.D. There have been a number of farmers starting new flocks. 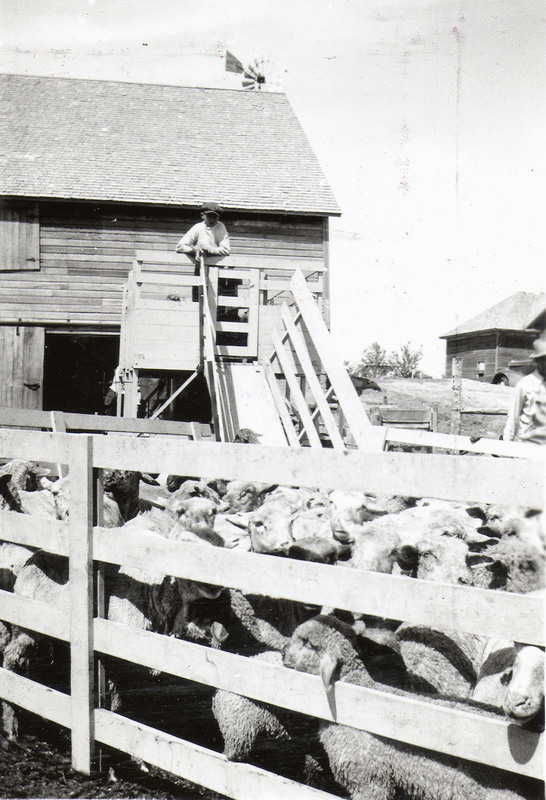 Buying of Westerns or old ewes has been discouraged because of the lack of facilities and shortage of feed. A ram sale was held at Wishek in October. 6 rams were sold off the trucks operated by the extension service. 3 others were sold by farmers that day. 8 farmers were assisted by the agent in obtaining purebred rams. 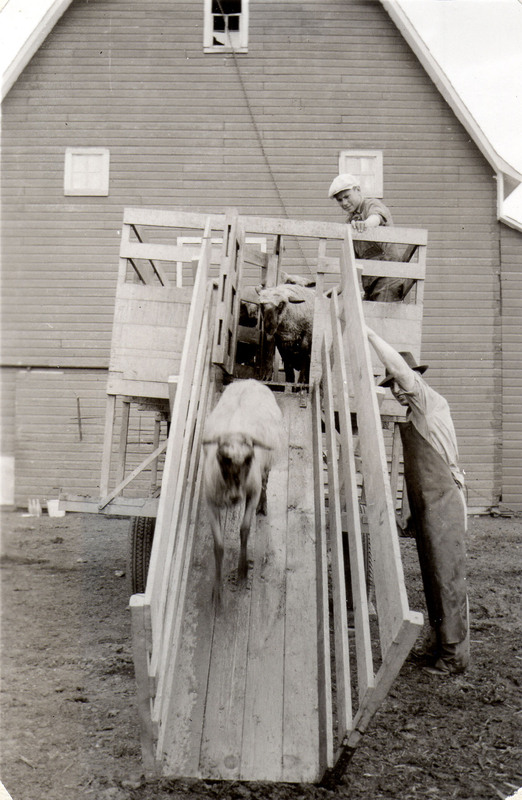 Photo (top) on p. 111, Sheep Dipping Demonstration Using Extension Department Dipping Tank on farm near Steele, N.D.
Photo (bottom) on p. 111, Sheep Dipping Demonstration Using Extension Department Dipping Tank on farm near Steele, N.D.
McIntosh County leads in numbers of licensed stallions in North Dakota . . . so little work is really needed on the horse project. Assistance was given in placing 2 registered Belgian stallions with two F.S.A. borrowers. The Wheat Marketing Quota campaign met with rather stiff opposition in certain areas of the county. However, it carried by a 3 to 1 vote, or approximately 77 ½ % in favor. . . .
A series of marketing quota educational meetings were conducted by the county agent and the county committee at nine different points in the county, from the 23rd to the 29th of May. The wheat crop was the best McIntosh county has had in about 15 or 20 years. 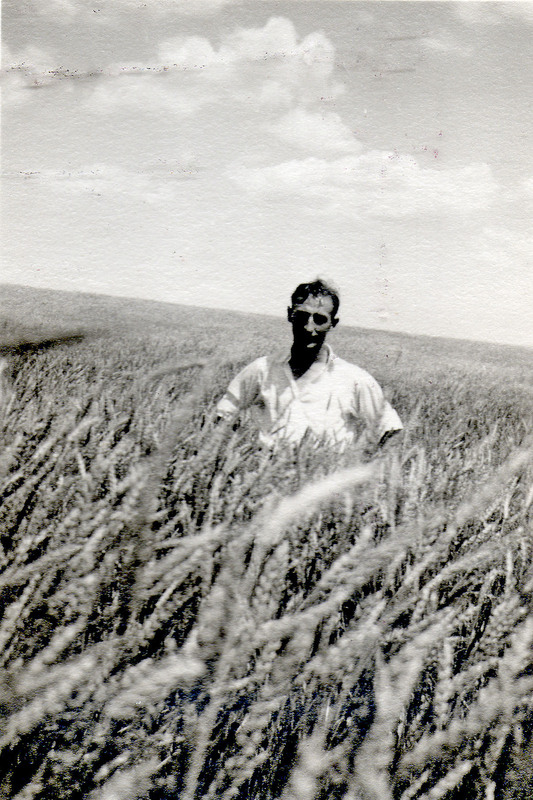 The farmers are convinced, in general, that wheat raising can again be made profitable by better tillage, good seed, weed control and proper production control through organized programs. . . . 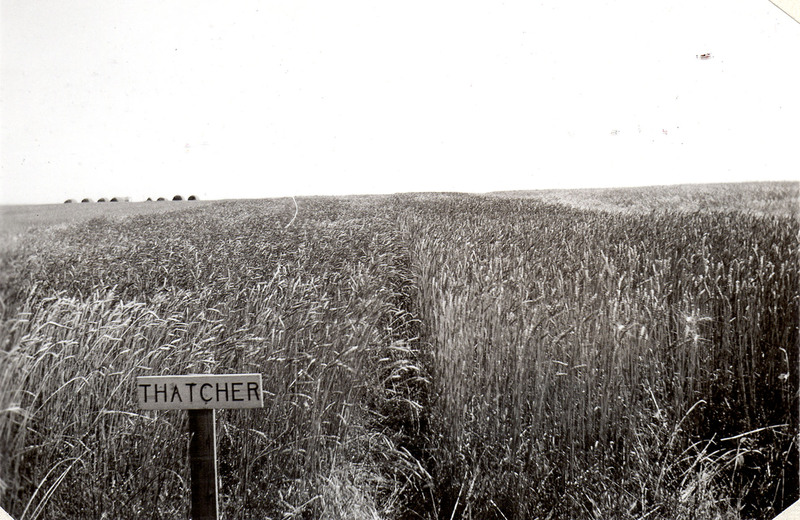 The Thatcher and Rival varieties make up approximately 80% of the wheat grown; others are Red Durum, Reward, Ceres, and Durum, in order of importance. 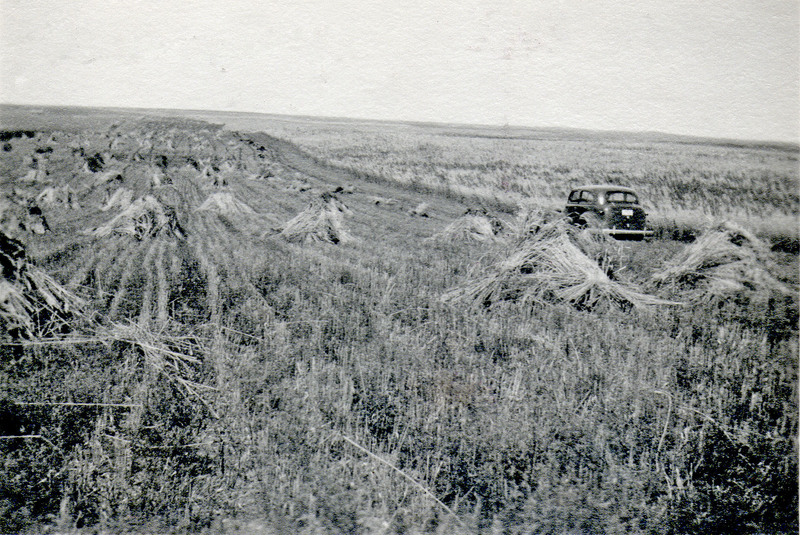 Photo (middle) on p. 70, Thatcher and Regent Strips on the Wishek Wheat Demonstration Plot / Note; the strength of straw in Regent on right compared to Thatcher just before harvest. 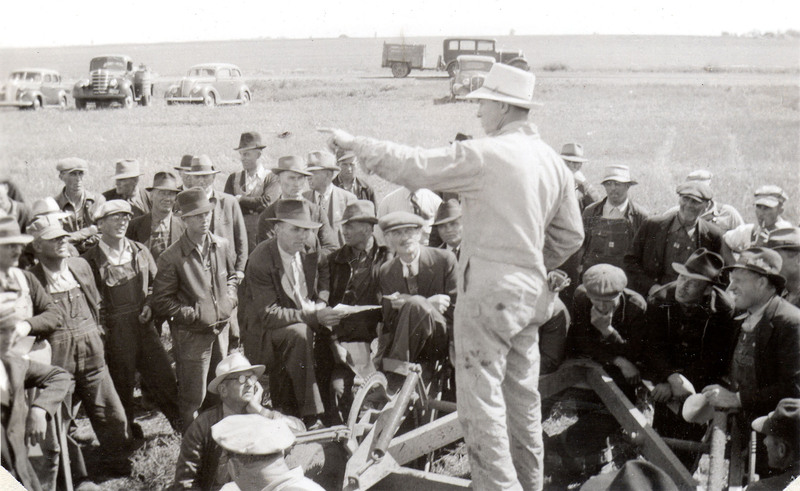 Many farmers had not drenched or dipped in 1940, so a dipping and drenching demonstration was held in June on the John Walz farm, in cooperation with the State Extension Service. 300 head were dipped and drenched. 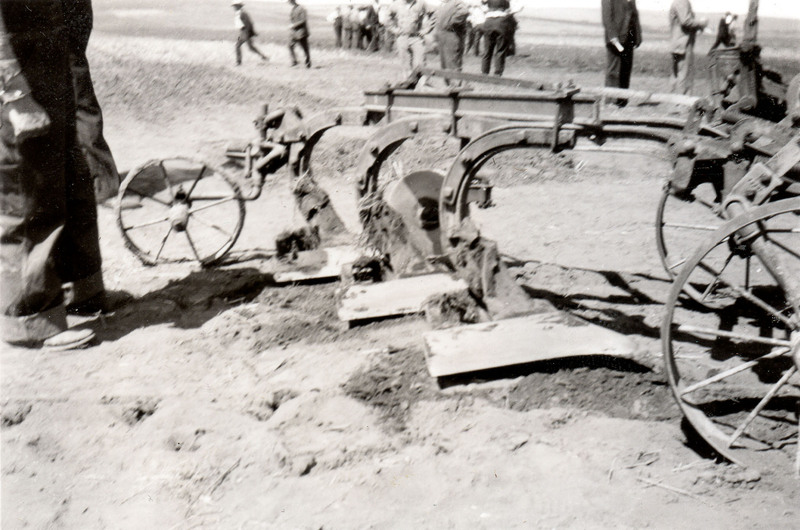 Photo (top) on p. 95, Chase Cultivator with Wide Sweep Shovels Demonstrated by S.C.S. The cotton mattress and comforter program in McIntosh county has worked out very satisfactorily and has provided an excellent opportunity to contact many farm and towns people. The application for 1400 mattresses and comforters were taken by the AAA county committee, Community Committees and the county office. . . . allowed 1145 mattresses and comforters. . . . Received were 97 bales of cotton, 10 bales of ticking, and 11 boxes of percale. Received in Ashley, Wishek, Lehr, and Zeeland. Commodity Credit Corporation placed a total of 239 grain storage bins in McIntosh county to relieve the congested storage situation. These are located in Ashley, Wishek, Lehr, Danzig, Venturia, and Zeeland. 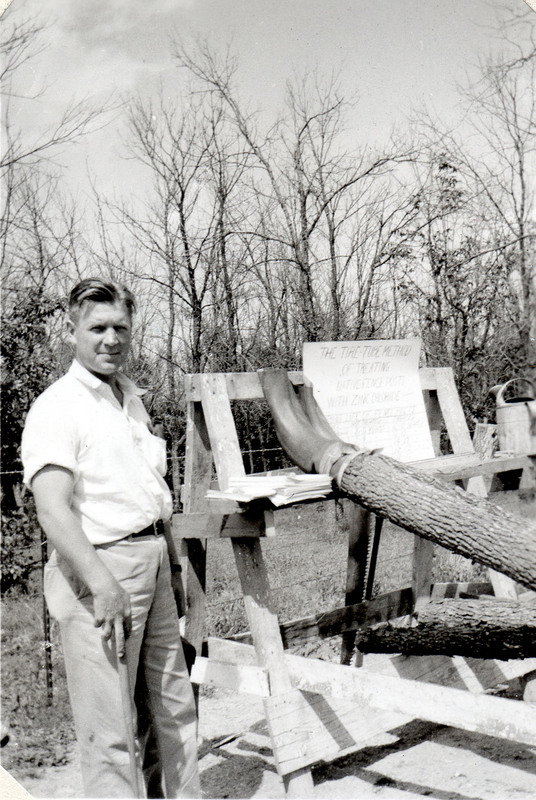 Also, 52 wooden bins were made available to individual farmers; 52 purchased them. 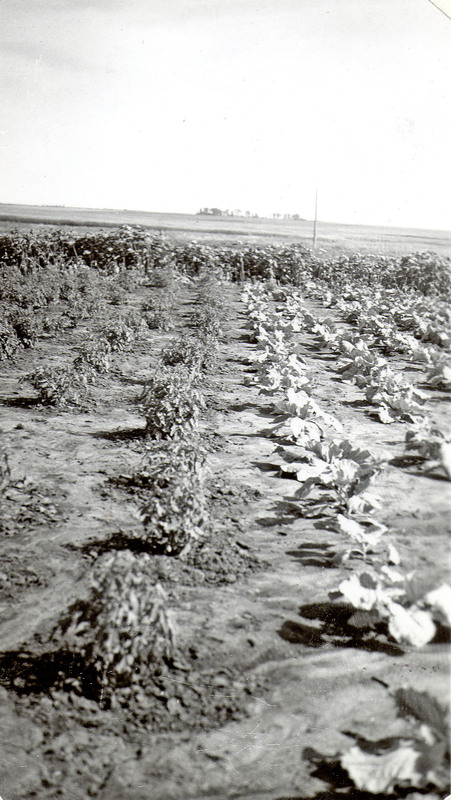 An extensive Victory Garden program was carried out in 1942. 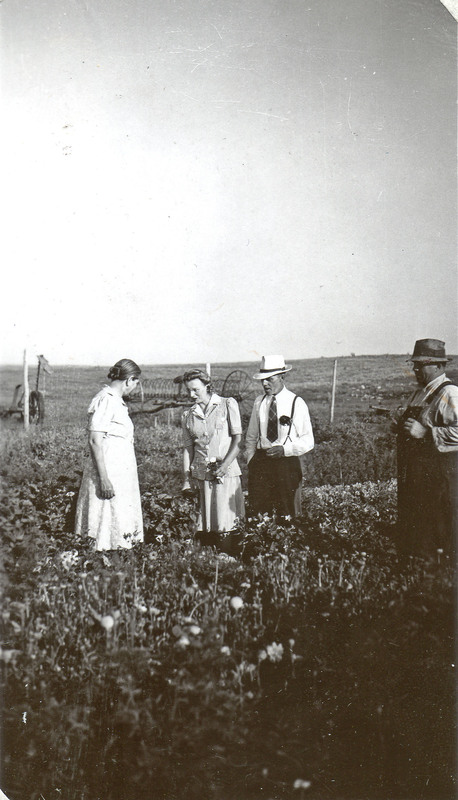 33 garden meetings were held on “Food for Victory” and “Victory Gardens”. A total of 109 county gardeners were personally appointed by letter from Governor Moses to serve as Victory Garden Committeemen in their respective townships and farms.